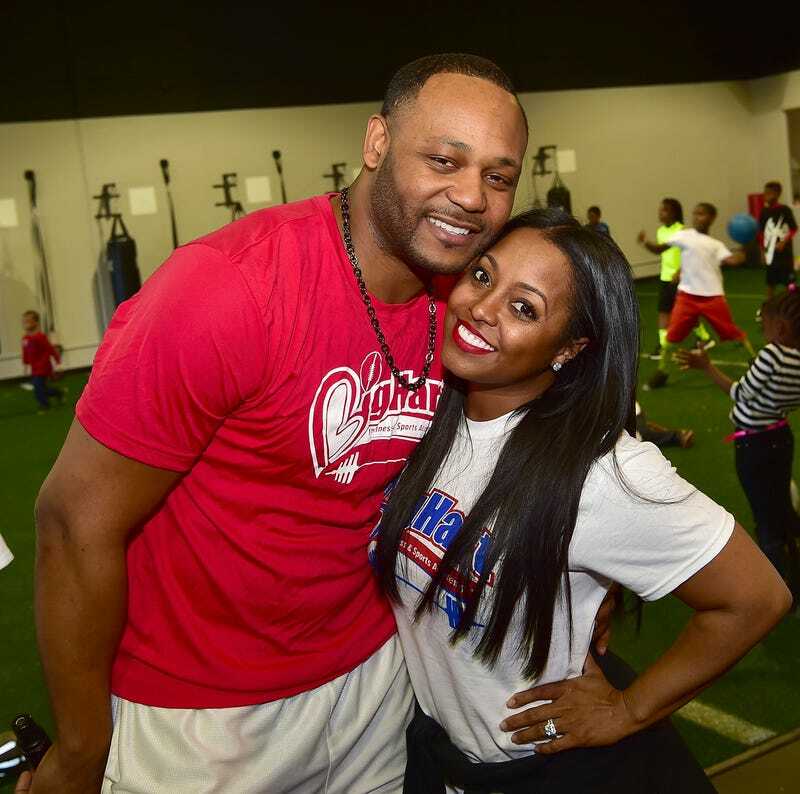 Ed Hartwell and Keshia Knight Pulliam attend the grand opening of his Big Hart Sports and Fitness Academy on Jan. 30, 2016, in Duluth, Ga.
Ed Hartwell is giving his side of the story when it comes to why he filed for divorce after being married to Keshia Knight Pulliam for only eight months. Earlier this week, Pulliam, who is pregnant, accused Hartwell of cheating on her after he requested a paternity test. In an interview with the New York Post, Hartwell gave his reasons for leaving the marriage and said he was pressured to have a baby with her immediately. "She wanted a baby really fast, and what I was trying to explain to her was that—from my beliefs, from seeing other successful people—that when you first get married, especially since we didn't have a long courtship, that we should actually focus on each other and not just have a baby," Hartwell explained. "That's something she really did want to do." Hartwell said he had a talk with Pulliam about the abruptness of getting married. "I think we probably messed up. I think we moved too fast. Our lives and wants are headed in two different directions." He even expressed that he still cared about his ex-girlfriend, who had lost a baby. "All she was mad about was, 'You don't want to have a baby, but you're mad about her baby. You can't talk to her.' And there was a big fallout," Hartwell said. Hartwell said that when Pulliam told him she was pregnant, things didn't add up because during the time they were growing apart, he was spending less time at home and had moved out. "I can't say she's been unfaithful. I can say she's stayed out, she's not came home, she's went out-of-town … for three days, I don't know what's going on," he told the Post. "I can't say she was unfaithful. I can say she wanted to get in vitro; I can say she wanted to do some things to make sure she got pregnant. I just want to make sure it is mine." Pulliam did an interview with Entertainment Tonight and stated that she didn't cheat and that she doesn't want to stay married to Hartwell. "I have no desire to continue to be married to him," Pulliam said. "I'm doing this one interview, and I'm done. I'm not going to continue to revisit, regurgitate, but I'm not going to continue to allow people to tell blatant lies about me."